﻿Why should you buy this LP? 1. Because of its super sound? Of course! 2. Because Paul Desmond and Jim Hall are playing? Naturally! 3. For "Easy Living"? Surely one of the best numbers in one of the most multifaceted versions! 4. Because you missed out on the first release in 1966? Well, don’t make the same mistake in 2018! Not everyone wants to purchase all Victor recordings by Paul Desmond and Jim Hall with umpteen alternate takes in a voluminous CD Box, to listen to it all, and to find it just wonderful to show off on the record shelf. 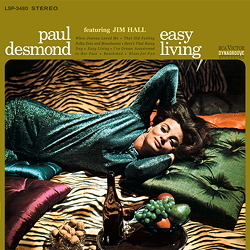 The eight numbers on "Easy Living" constitute the height of Desmond’s career anyway after he had at last managed to take his leave from Dave Brubeck’s group. And the change from purely chordal playing and single notes from Jim Hall is more airy and more inspiring than the meaty piano clusters of his former boss. And don’t forget either that half of the Modern Jazz Quartet, namely the bassist Percy Heath and the drummer Connie Kay, deliver an exquisite skeletal structure over which the musicians can improvise brilliantly. LPs are, and remain, unbeatable, both as regards sound and feel. And happily they are also a safe investment – maybe not all, but "Easy Living" with Paul Desmond and Jim Hall most definitely!